The Federal Reserve’s next big policy event is on Wednesday. To end its two-day meeting, the Federal Open Market Committee (FOMC) — which steers Fed policy — will publish its latest statement at 2 p.m. ET. We’ll get updates to its forecasts for growth, interest rates and inflation. Then, Fed chair Janet Yellen will hold a press conference starting around 2:30 p.m. ET. Virtually no one expects that the Fed will raise its benchmark rate now, or even in July. That’s mostly because a lot suddenly changed on the first Friday in June. We got the May jobs report that showed the economy added 38,000 jobs — the fewest in six years. The unemployment rate fell to a new cycle low of 4.7%, mostly because fewer people bothered to find a job, as the participation rate fell to a 2016 low. Yellen spoke in Philadelphia the following Monday, emphasising the economy’s strengths. She said it’s important to not attach too much importance on one month’s data. But Yellen and the Fed would definitely want to be sure that the slowdown was temporary, possibly ruling out the next rate hike until at least September. The statement would likely reflect that economic growth picked up after a first-quarter slowdown. But talk of global economic risk may make a return given the British referendum on its European Union membership next week, said Jefferies’ Ward McCarthy in a note. 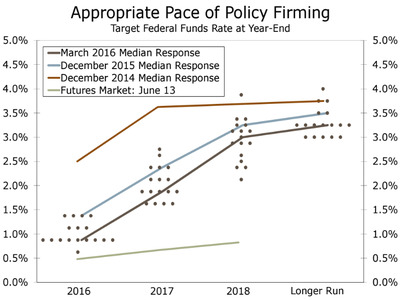 The dot plot shows where FOMC members think the target fed-funds rate should be at the end of the next few years and in the longer term. 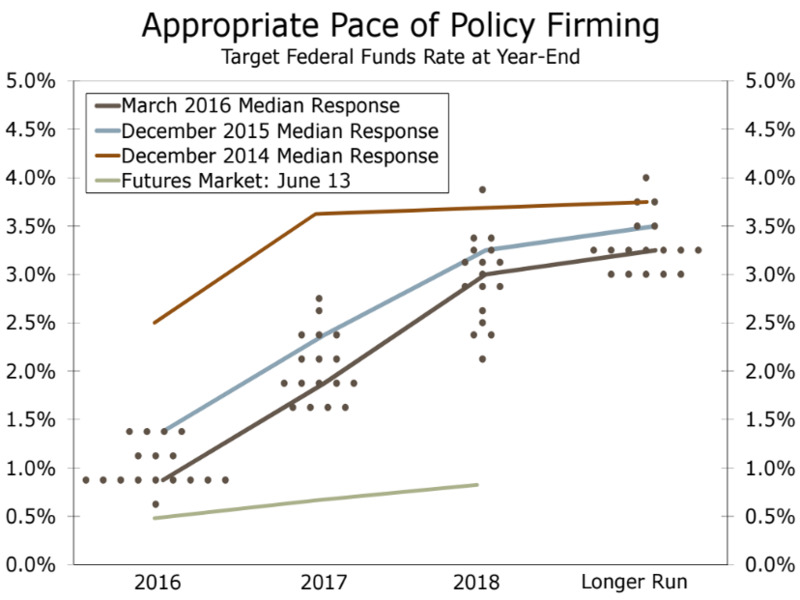 The dots were lowered in March to reflect two rate increases in 2016, halving the earlier projection. And with half of 2016 over, markets will likely shift to what the Fed is communicating about next year, according to LPL Financial chief economic strategist John Canally. 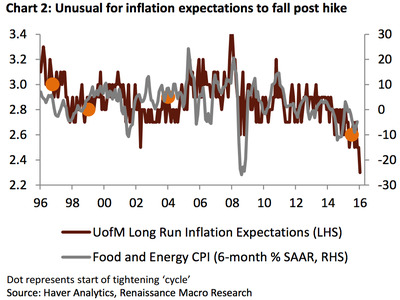 Wells FargoThe Fed has indicated it won’t wait for the futures market to catch up. That could make the disconnect between the Fed’s and the market’s thoughts on where rates should be more troubling, Canally said. But Yellen may look past this and other excuses to delay rate hikes “because monetary policy affects the economy with a lag,” she said recently in Philadelphia. The key thing to watch with the dots is how many officials see just one hike this year, said Neil Dutta, head of economics at Renaissance Macro, in a note. That’s because the Fed is now grappling with what is the right level of rates to maintain full employment and 2% inflation. And given the recent drop in the participation rate and continued low productivity, the longer-run estimate is likely to fall to 3% from 3.25%. “This is all consistent with the notion that low policy rates on their own likely overstate the degree of monetary accommodation in the economy,” he said. While the Fed’s GDP and unemployment forecasts may be cut, “we would not be surprised to see a modest bump to future inflation,” said Wells Fargo’s Sam Bullard in a note. 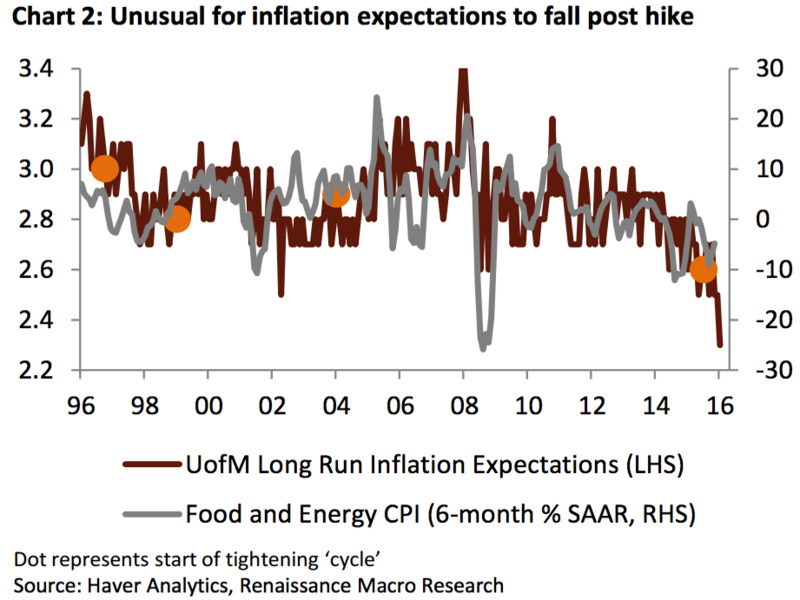 But that would be at odds with households’ long-term inflation expectations, which steer the actual trend, and fell to a new low of 2.3% in June according to the University of Michigan’s consumer sentiment survey. Since the March meeting, two of the big transitory factors holding down inflation have improved; commodities have rallied, and the broad US dollar has weakened a bit. But the drop is enough to put July off the table, prompt the FOMC to rethink its central forecast for two hikes this year, and push back 2017 expectations, said Dutta.